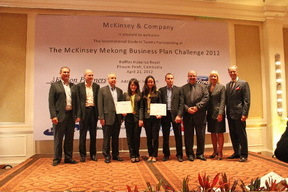 McKinsey Mekong Business Plan Challenge 2012 is organized by a partnership of McKinsey & Company and National University of Management, Phnom Penh. It is a 6th year competition, more than 100 teams from Mekong Region competing, with an aim to promote entrepreneurship among university students in the Mekong Region and to launch new businesses and social ventures. 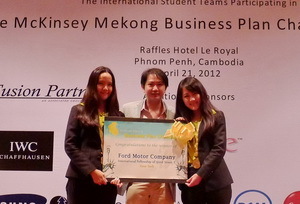 The road to achieve a gold medal in McKinsey Mekong Business Plan Challenge 2012 was not easy, yet achievable. We spent almost half of the year, to launch our business plan namely, �Palmoboard�. The Palmoboard is a fiberboard (wood-substitution product) manufactured ecologically from agricultural and industrial palm oil wastes. Fiberboard is then exploited further to make furniture. Based on our differentiated technology, the palm waste fibers are chopped, commingled, and glued into fiberboard without utilizing chemical substance in manufacturing process. Unlike other fiberboards in the market, they are compressed by Formaldehyde Rasin, which causes cancer to end-users as well as worsens global warming. Additionally, our product offers competitive advantages in terms of availability, renewability, architectural versatility, low cost of production and ecologically sustainable benefits to society. Our team consists of two members, Ms.Chanakarn Srisinthorn and myself, Ms.Pinyaphat Aurchaikarn. On November 2011, we entered into the competition by our business proposal which we noticed that there were more than 25 million unused palm oil wastes left in Thailand as a by-product from palm oil production process. Successfully, we were selected as one of a two team from Thailand to compete in Final round in Phnom Penh. Starting from the ground, we conduct critical research on Palm Oil industry, Wood Industry and Furniture Industry. We consulted and interviewed experts, such as Dr.Nikom Lhamsak (a well-experienced professor at a faculty of forestry, Kasetsart University), Mr.Worratham Unchittichai (a president of Royal Department of Forestry), to gain exposure of the situation in industries. The presentation was conducted in Raffle Hotel, Phnom Penh on April, 21st 2012. There were 10 finalists; each was given overall 30 minutes on the stage. By the end of the day, the winner was announced and we were not expecting it. It was indescribable feeling to get feedbacks from the 7 honorable judges ( McKinsey, Google, Ford Motor, Fusion Parters, etc.) that we confidently proved that our business plan is realistic and lucrative investment opportunity. The success cannot be achieved by only us two. We would like to express our deepest appreciation to Asst. Prof. Dr. Sarayut Nathaphan, who has been a supportive advisor in every steps of business plan and a huge encouragement in Phnom Penh. Additionally, Mr. Anak Tangtatswas (BBA#15, McKinsey mentor) and Dr. Woraphong Janyanyuen were regarded with our heartfelt thanks. We do owe a great many thanks to all the supports, from whom we have not mentioned. We were extremely proud to be educated and nurtured by BBA Thammasat, which has paved us with solid necessary business foundation, from well-experienced professors. The experiences from the competition has taught us, to always put more than 100% contribution to the work, and to always stay enjoyable and have a great time doing it. Regardless what consequence may bring, we were fulfilled with irreplaceable knowledge and amazing memories. Our team was just additionally blessed to be award, as a winner. Posted date: April 30, 2012 � 15:10 hrs.